Few feats of engineering are as impressive as a military-grade helicopter. Today worth millions of dollars each, these high-tech birds are a formidable military asset, including, among many other uses, for rescue operations- all a fact US military personnel helpfully chose to ignore during Operation Frequent Wind when they pushed several dozen of them into the sea, in one case for no other reason than to save a mother, a father, and their five children. For anyone unfamiliar with it, Operation Frequent Wind was the name give to the final phase of evacuations during the Fall of Saigon- effectively the final days of the Vietnam War. 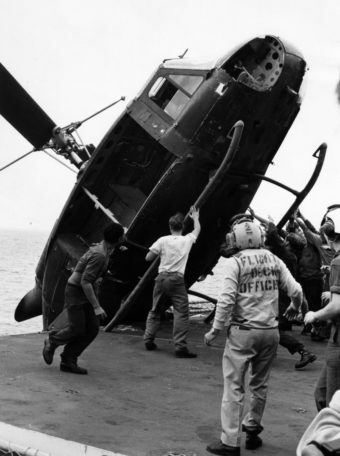 Noted as being one of the largest military evacuations in history and the largest involving helicopters as the primary means of evacuation, Operation Frequent Wind is celebrated as a logistical success for the US due to the fact that a few dozen helicopter pilots were somehow able to evacuate over 7,000 people in around 18 hours. This is made all the more impressive when you realise that the mass evacuation was never supposed to involve helicopters much at all. You see, while Operation Frequent Wind is now famous for being the most successful mass helicopter evacuation ever organised, using helicopters as the primary means of evacuation was never the original plan- it wasn’t even the backup plan. It turns out that it was the backup to the backup to the backup plan. Known initially as Operation Talon Vise until North Vietnamese spies heard whispers of it, the plans for a mass evacuation of Vietnam had been in place for several years and were originally supposed to involve the primary use of both commercial and military aircraft which would evacuate at-risk citizens and military personnel, with the total slated to be evacuated estimated to be about 2 million people. Failing or in addition to this, the idea was to dock ships at Saigon port and load them with as many people as possible. In the event none of these options were possible, the final, Hail Mary plan was to instead use military helicopters to transport people to ships off shore. Of course, evacuating the original estimate of 2 million people was never an option for the helicopter plan alone, nor even the extremely whittled down number of about 100,000-200,000 that military brass eventually reduced that figure to. Instead, at this point it was just as many people as they could as fast as they could. So why did the US have to fall back to literally their least effective option if they’d been planning the evacuation for years? Well, much of the blame falls somewhat unbelievably to the actions of a single man- Graham Anderson Martin, the American ambassador to South Vietnam at the time who steadfastly refused to agree to start an evacuation for fear of mass panic and given his unshakable faith in the notion that the threat of the “superior American firepower” would keep the enemy at bay. Despite this, recommendations did go out in advance of Operation Frequent Wind that at risk people should leave the country, resulting in a total of around 50,000 people, including a few thousand orphans, leaving via various planes in the months leading up to an actual evacuation being started. This was mostly done via supply aircraft who would bring supplies in, and then load up as many people as they could for the trip home. Yet an official full scale evacuation, which would have seen these efforts massively ramped up, was continually stalled by Martin. Military brass tried and failed to persuade Martin to change his mind, with Brigadier General Richard E. Carey going as far as to travel to Saigon to plead personally with with the ambassador. This was a meeting Carey would later diplomatically call “cold and non productive” and should be noted took place on April 13th, 2 weeks after preparations were already supposed to have begun for the mass evacuation. This back and forth continued until April 28th when North Vietnamese forces bombed the Tan Son Nhut Air Base, effectively eliminating any possibility of getting people out via large aircraft capable of mass evacuation. When this was pointed out to the Martin, he still refused to call for the evacuation, deciding to wait until the next day so he could drive out to the base and confirm the damage for himself. Upon confirming that North Vietnamese forces had indeed destroyed the air base and the best option for a mass evacuation, he finally relented. This was an order that was relayed to soldiers on the ground via the official Armed Forces Radio station by the words “The temperature in Saigon is 105 degrees and rising,” followed by the playing the song I’m Dreaming of a White Christmas by Bing Crosby. As a direct result of Martin’s stubbornness, the military had no choice but to rely on the least effective means of mass evacuation- via helicopter, with the operation officially commencing later that afternoon at 14:00. Even as the operation began, Martin’s bullheaded refusal to prepare in anyway for an evacuation caused problems for certain helicopter pilots, most notably the ones trying to evacuate him and his staff. On that note, to his credit, Martin refused to leave once the evacuation had begun, though this was much to the annoyance of the pilot, Colonel Gerry Berry, sent to fetch him. Instead, Martin continually had refugees boarded while he simply waited with his staff in his office, knowing that as long as he was there, the helicopter would keep coming back allowing more lives to be saved. With an order supposedly from the President himself, though not actually in reality, Martin finally relented and allowed Berry to complete his mission by transporting Martin and his entourage. Of course, what the military brass had failed to remember after this supposed last flight was that they’d accidentally left almost a dozen soldiers behind at the compound… This wouldn’t be realized for many hours, but all 11 Marines were rescued after being forced to barricade themselves on the rooftop for the night in case of an attack. Leaving the evacuations as late as Martin did understandably resulted in mass panic across Saigon with many thousands of South Vietnamese citizens fleeing in everything from cars to stolen planes and helicopters. In addition, lack of time meant that helicopter pilots had a laughable number of people to rescue, resulting in many ignoring the “recommended” weight limit of their craft and massively overloading them to the very extremes of what they could handle given the pilot’s assessments and weather conditions. In one case, one pilot noted he was overweight to the point that he could only hover inches off the ground, but no one was willing to get off as for many it would mean their life if they could not get out of the country. He then stated he thought if he could get some forward speed he could get the additional lift needed, so simply pitched the craft forward and took a dive off the rooftop he was on, barely recovering before hitting the rooftops below and then managing to very slowly climb from there. As for these pilots, they were instructed to ferry evacuees to waiting ships in the South China Sea, many of which quickly began to run out of space resulting in people sleeping double in the small bunks, as well as just anywhere on the ships there was available space for someone to sit or lie down on. On top of that, any South Vietnamese pilots that could manage to get a hold of their own helicopters and flee to sea were also crowding the decks as they arrived. This resulted in the order to push some of these South Vietnamese helicopters overboard to make more space, or orders for some pilots to simply crash their helicopters into the ocean and await rescue after they’d dropped off any passengers. This all brings us around to the incredible story of Major Buang Lee. Knowing he and his family- a wife and five children- would in all likelihood be executed if they couldn’t find a way out of the country immediately, the Major managed to commandeer a small Cessna O-1 spotter plane. Under heavy fire, he managed to take off and flee the country with two adults and five children jam packed aboard the tiny, slow moving aircraft. He then headed out to sea in search of a ship to land on or ditch the plane next to. About an hour and a half off the coast and with only about an hour of fuel left, he finally found one in the USS Midway. The issue now was there was not sufficient room to land on the ship, owing to the number of helicopters on the deck. Unable to find the right frequency on the radio to talk to those on the Midway, Buang resorted to dropping notes. The captain of the vessel, one Lawrence Chambers then had a decision to make. While it was possible to move some of the helicopters out of the way, there was no room to move them all. The young captain, only appointed to that post some five weeks before, decided that there was little chance the family would all survive if they tried to ditch in the sea next to the Midway and be rescued that way. So, thinking he’d likely be court-martialed for it, he made the call to move what helicopters could be moved and dump the rest in the ocean after stripping them of any valuable gear that could be removed quickly. In total, some $10 million (about $65 million today) worth of helicopters were ditched in this way. There was another problem, however. The plane in question typically needs a minimum of a little over 600 feet of runway to land and come to a full stop. The Midway itself in total was about 1,000 feet long, but the runway deck was only about 2/3 of that, meaning there was zero margin for error here. Thus, in order to land such a craft on the deck with enough margin of safety, the ship really needed to be moving as fast as possible to make the plane’s relative speed slow enough that it could stop in time before falling off the end. Using the cable system to stop the craft faster wasn’t deemed a good option as in all likelihood it would have just resulted in the landing gear ripping off and/or the plane flipping over in a spectacular crash. Unfortunately, Chambers had previously granted the ship’s engineers permission to take the Midway’s engines partially offline for routine maintenance. After all, helicopters did not need nor want that relative wind, especially when landing on such a crowded deck. With this, the ship was able to achieve the requested speed and Buang’s landing was also helped by another 15 knots of headwind, further reducing his needed stopping distance. With that done and deck cleared as it could be, Buang was given the greenlight to land, ultimately doing so with textbook precision and with plenty of deck to spare, becoming a rare individual in relatively modern times to land such an aircraft aboard a military carrier. And, thankfully for Captain Lawrence, he was not court-martialed for ditching rather valuable military hardware to save Major Buang and his family, and instead enjoyed a continuance of his successful career, eventually retiring as a Rear Admiral. In the aftermath of Operation Frequent Wind, the U.S. ships continued to hang around for a few days off the coast, trying to pick up as many refugees from the water as they could. Finally, the order was given to head home, forcing the commanders to leave many thousands of people that had been promised evacuation behind. I wonder why they didn’t have the helicopters all take off to get more people, and while they were gone the plane could land?